Daniel Reuss has held the posts of artistic director and chief conductor with the Estonian Philharmonic Chamber Choir since 2008. 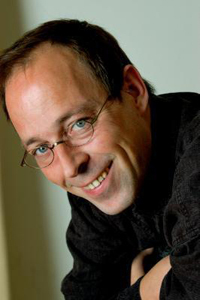 Born in the Netherlands in 1961, he studied choral conducting with Barend Schuurman at the Rotterdam Conservatory. In 1990, he became chief conductor of Cappella Amsterdam, which he turned into a full-time professional ensemble. Between 2003 and 2006 he led the RIAS Kammerchor in Berlin as chief conductor, with whom he recorded a number of award-winning CDs. In 2007 he made his debut at the English National Opera with Handel's Agrippina. As guest conductor, Daniel Reuss has worked with numerous renowned European ensembles, including the Concertgebouw Chamber Orchestra, the Akademie für Alte Musik Berlin, Concerto Köln, the Schönberg Ensemble, the Netherlands Radio Choir, Collegium Vocale Gent, the Balthasar Neumann Choir, the SWR Vokalensemble, the Stavanger Symphony Orchestra, the Nieuw Ensemble, Prometheus Ensemble and Viotta Ensemble.